If you are experiencing problems with the Master Account system in general, please post them here! Niko's guide How do I take a screenshot? Post a picture? Make a sig with a link? explains how to take a screenshot, how to get it to an image hosting site, and how to get the link for your post. Please be sure to clear your cache, close your browser, and then try to relogin before you post a report. Reminder: Please do NOT provide your Master Account username! You can provide your game character id if you wish. - There is not a way to delete an EpicDuel character yet. Bug Info:I am having problems linking games to my master account. Everytime that I try to sign in and link the games it says that the games that I am trying to link are linked already. Is there a problem on my end or what? I signed out and then I signed back in and it still isn't working. For example I am trying to link my Mechquest account and it says that it has been linked to another account. Mira, if you already linked your account (e.g: your MQ account) to a Master Account you can't link it on another Master Account. If you were NOT the one who linked your account to another Master Account then somebody knew your passwords and linked them to his Master Account. I bought membership for my aqw charecter trough battleon points how do i get my trasaction id because it was not sent to my aqw charecters email or my battleon email? I made my master account today in order to test Bladehaven. I linked all my accounts, including my AdventureQuest Guardian account, which I have held for several years. When I attempt to play Bladehaven after this, however, it told me I had not met the requirements. The Guardian account is still linked up to my master account. My AdventureQuest account is nox_sicarius, and the Guardian character is Malchior, if you need to check for any reason. I just achieved a little over 4000 BattleOn Game Points, and deleted one of my characters to make a new one to make a Guardian. 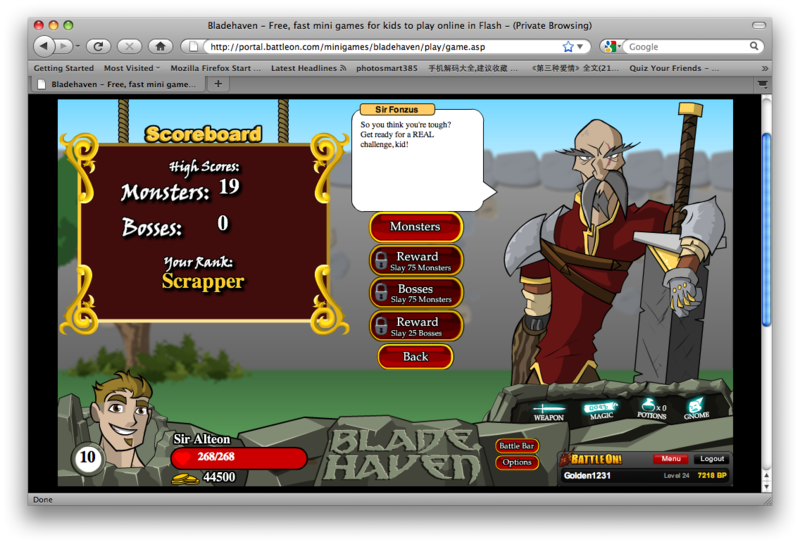 I used the BattleOn Game Points to upgrade said character to Guardian status, but the upgrade went to my deleted character! Now I'm out 4000 points and without any upgrade! EDIT: This bug has been fixed. Due to some Unfortunate Implications, I can't seem to get to my original Master account that had all of my game accounts on there. It is not so much as I can't change the password, as much as my E-mail account that was used for my original master account has been "Deleted", and well... In short, I can't access the account with the E-Mail address [email protected]. I do not remember what the account name was, but I do know what game accounts are on that Master Account. on my aqw account work to my dragonlord, star captian, or guardian. Ididn't tell anyone my password and i haven't doen it is there something wrong. My account wont let me buy BP. I recently bought BP about 2-3 months ago via debit card and i recently been trying over the past few weeks to get more and it has declined for some reason and its nothing to do with my card because i recently borrowed my dad's debit card with his consent ovcourse and the same problem happend..
Said that it declined for no apparent reason. Did the bug happen again? (if it did not, no need to post!) yes,Iv been trying for the past few weeks. Please contact the master Help team if you have problems with specific accounts, or specific credit/debit cards not working. In most cases, the help team will need to investigate the payment attempt or account info and figure out what's going on. I am unable to buy points using cherry credit exchange. Cherry must be doing some unannounced maintenance. When they do maintenance, it usually only lasts for a few hours. 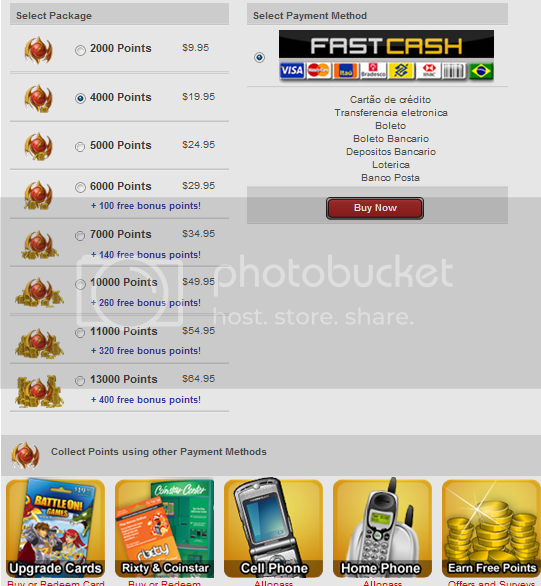 I can now use FastCash in Brazil (big thanks! ), but I am completely unable to use PayPal. The only payment method that shows up is FastCash. I have always bought my upgrades with PayPal, but since FastCash became available, I can't use PayPal anymore. I was told to "hide" the paypal option for Brazil users for now. It will probably come back on soon. 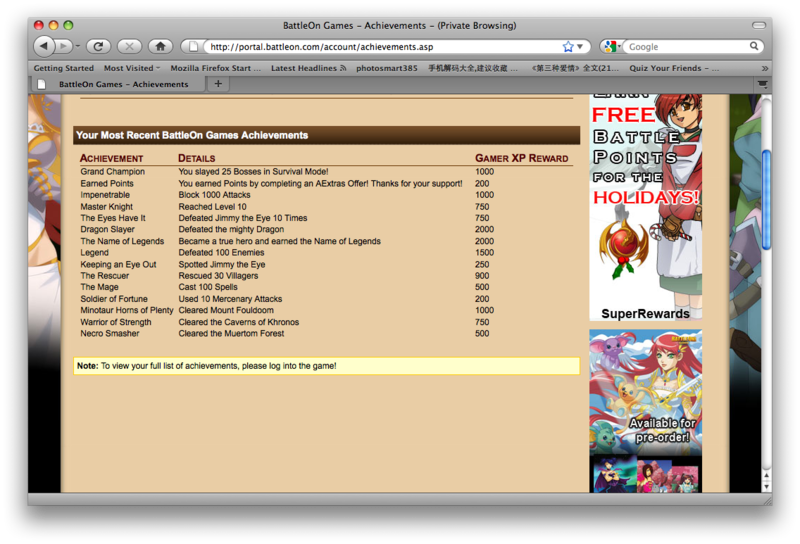 There is a bug where any number you enter into the redeem gift card code will give you 4000 battleon points. I have tried it, but have not used the points. That's not really a bug. It's just that the redeem system assumes you're about to redeem a 4000 point card. If you click the "next" button after you see that message, and your card number is fake, you'll get the message "Invalid pin number"
I want to talk to master account help, but I'm worried. I'm the creator and owner of my account and currently have access to it but I lost the password to my email address a few months ago. Then I realized that I also had forgotten the master account name that I linked my account to (torpedo or something random) I had not worried about forgetting it before since I could easily recover it. If I contact master account help will they delete or ban my account because they don't believe that it's mine?? I can't recover my hotmail account since I provided a bogus security question and no linked email address. Is it safe for me to ask for help? This concerns the Achievements for BladeHaven. Although I haven't even gotten past the "Kill 75 Monsters" in Survival mode, my Master Account has an Achievement that says I have defeated 25 Bosses in Survival Mode. Of course this is absurd, since the Bosses require unlocking. I just logged on one day to find an achievement that I couldn't possibly have unlocked. It's a pretty harmless glitch, but I'm sure someone will find some way to exploit it... Please fix it soon! Not a 'bug' really, but I think this is he best place to post it. As soon as I went on to the BattleOn Portal today, This Ad popped up. I'm pretty sure AE don't have ads like this, but if they do; sorry.